Now my first instinct is to get all academic and reel off some complicated financial formula, or maybe quote a statistic or two from Harvard Business Review. But then, I pause. Because the answer is much simpler than that. Businesses that are winning, whether Christian booksellers or a company like mine with nearly 500 team members, have learned one simple rule: People matter most. Your customers. Your family. Your team members. They all love. They have goals and dreams, heartbreak and happiness. They all matter. So how do you go about serving others when you barely have enough time during the day to get everything you need done? Here are just a few guidelines that my leaders and I follow. Most of these ideas don’t take any time at all. One of the core principles of my company is a simple rule that’s been practiced for thousands of years: “Do to others as you have them do to you” (Luke 6:31). When you follow the Golden Rule—put yourself in someone else’s shoes and act the way you’d want to be treated—decisions become easy. Recently, one of my team member’s sons suffered an aneurysm while at camp several hundred miles from home. He wasn’t expected to make it through the day. I too was many, many miles from home. Without even stopping to let me know, my leadership team rented a private jet and immediately sent the family to be with their son. The cost was never even a consideration. Why would they do that without my permission? Because every last one of them knew that that plan of action was exactly what they would want someone to do for them. And it’s what I would do too. The young man survived and is doing well today. And his father? We earned his undying loyalty and appreciation. Although it may not be as serious as an aneurysm, every one of your team members will have some type of issue this year. Whether it’s a mom needing time off to attend her son’s first ball game or something as simple as a team member needing a ride to work, always put yourself in their shoes and think how you would want to be treated. It will not only change your perspective, but everyone else’s too. If there’s one word in the dictionary that should be on the to-do list of every employer, it’s grace. Why? Because no one—including you—is perfect. If we know that someone deeply cares about their job, we’ll give them a second or third chance. Even when I mess up, my team members are quick to forgive because they know my heart is in the right place. Unless it could jeopardize your store or possibly harm someone, always err on the side of giving too much grace. At my company, we make a habit of catching people doing something right and let them know about it. Everyone wants to know they matter. Each week, I schedule time to walk through the office. When I spot someone rocking it, I’ll give a loud whoop and a “You are awesome!” No matter their age, they light up. You may not want to scream “You are awesome!” in the middle of the store. But you can catch your team members doing something right and let them know without scaring your customers half to death. At my company, we all meet once a week. A few minutes of each get-together focuses on praising someone who’s doing an awesome job, whether it’s reading an email from a customer or just simply acknowledging them for their hard work. I’ve also learned from experience that the most effective recognition is when someone isn’t expecting it. Catch them off guard. An unexpected $50 handshake for a team member who went above and beyond for a customer or sold the most that week? Even better. And you’ll be amazed how much a free movie ticket or Starbucks card for someone rockin’ it will get you. Others will see it and want to do the same. When you put other people first, the atmosphere changes. Not only will you be happier, the money will naturally follow. Besides, at the end of your life, you won’t be wondering whether you made another 1-2 percent margin. You’ll be thinking about the lives you’ve helped to change because people are what matter most. Dave Ramsey is America’s trusted voice on money and business. He’s written five New York Times best-sellers, including EntreLeadership and Smart Money Smart Kids. “The Dave Ramsey Show” is heard by millions of listeners each week on hundreds of radio stations. 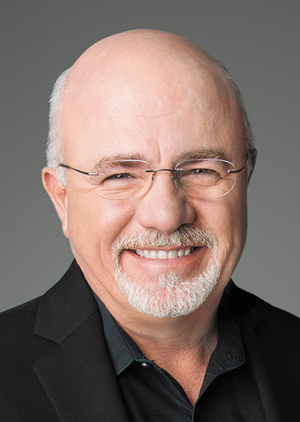 Follow him on Twitter at @DaveRamsey and at daveramsey.com .